Clutch is mechanical device which is used to transmit rotating motion or torque from one shaft to another shaft when required. 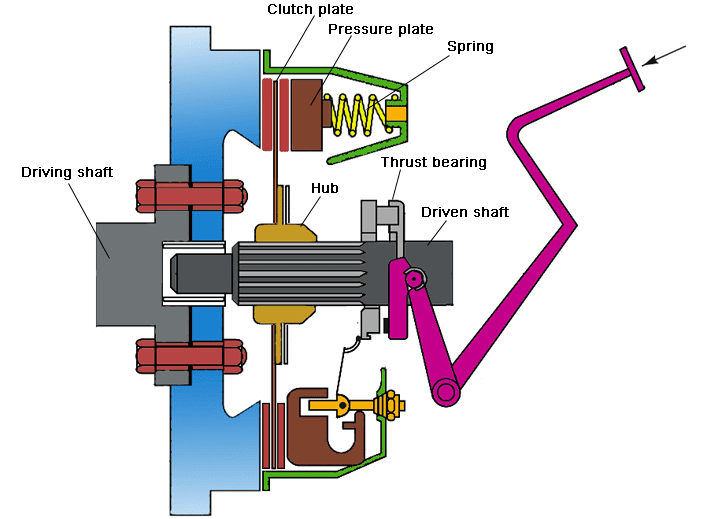 Clutch provides a temporary connection between input and output shaft. Clutch lies between the engine and the gear box. We can easily connect and disconnect the power transmission from one shaft to another by means of clutch as we do in automobiles while changing gear we press clutch lever to disengage the shafts and after change the gear we again release lever for engagement. Depending upon the number of friction contact surfaces the friction clutches as single or multi plate clutches. Here we study about single plate clutch. It is a type of friction clutch in which power is transmitted by means of friction between the contact surface usually called clutch plates. As name suggest a this clutch consists of only one clutch plate with both side friction lining (frictional surface). These surfaces have high Coefficient of friction. Single plate clutch also called dry clutch because no lubricant is used as coolant. A single plate clutch is consisting of various parts; for proper working. They are arranged in a systematical order. Mainly it consists of a clutch plate with both side friction lining and some other parts which helps in the proper functioning of a clutch like flywheel, pressure plate, thrust bearing, hub, springs and input mechanism for engaging and disengaging of clutch. Clutch plate is attached with the hub between flywheel and the pressure plate, it moves axially on driven shaft. 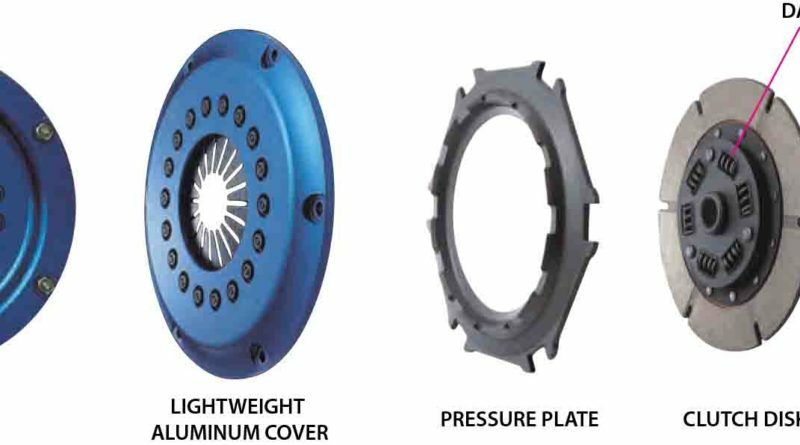 In singe plate clutch; clutch plate should have both side friction lining because it is mounted between pressure plate and flywheel, friction is responsible for the torque transmission. The pressure plate is attached with the flywheel and springs. Pressure plate helps to push the clutch plate towards the flywheel. A lever is attached to thrust bearings with some mechanism on driven shaft which transmits input and output motion from clutch pedal. We can divide different parts of single plate clutch as driving side parts and driven side parts. Clutch plate is junction between the both sides. In driving side flywheel is attached to engine and driven members are pressure plate, springs, thrust bearings and liver etc. In single plate clutch only one clutch plate is used. Clutch plate is main component of clutches. It is thin disc type metallic plate having both side frictional surfaces. Frictional surfaces on plate must be of such material to provide friction for transmitting torque without sleeping. The coefficient of friction of contact surfaces should be high for proper connection without slipping. Clutch plate is assembled in between flywheel and pressure plate. The pressure plate which is generally made up of cast iron. It helps in applying pressure on clutch plates to maintain the proper contact between the surfaces of flywheel and clutch plate by means of spring which are attached to it. Springs are used to maintain the pressure on pressure plate for proper connection between clutch plate and flywheel and prevent the slipping of contact surfaces. Flywheel is attached to engine output and its other side comes in contact with clutch plate when pressure is applied by the pressure plate. This includes foot pedal, linkage, bearing and lever etc. All these components are connected in a sequence. Foot pedal is located inside the automobiles; a lever mechanism is attached with foot pedal which transmit the motion from pedal to spring by means of thrust bearings. Working of single plate clutch is very simple. A mechanism is responsible for the engagement and disengagement of clutch. We easily engage and disengage the torque transmitting shafts just by apply some force on the paddle of automobile. A lever is attached to the paddle which is responsible for the force transmission from the paddle. When pedal is pressed spring is compressed and engine is free to move without any load. 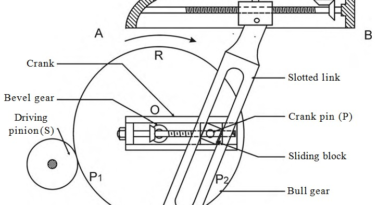 Lever is attached in such a manner when we press the clutch paddle thrust bearing moves forward and pressure plate moves backward or it moves away from the flywheel; due to this the connection between the clutch plate and flywheel released and shafts are disengaged. This time we can easily change gears in case of automobiles. Again if we want to engage the shafts just release the clutch paddle; then springs attached to the pressure plate push the pressure plate forward. Clutch plate is mounted between the pressure plate and flywheel on the hub. Clutch plate has both side friction lining that’s why it mounted in between pressure plate and flywheel and helps in torque transmission. Less slip occurs in it; slip is occurs only at the time of engagement after engagement no slip occurs and the functioning becomes very smooth. Power losses are very less. Less heat generates because only single plate is used. Heat generation creates problem in power transmission and can damage the working parts. Sometimes it works as a safety device and prevent the damage in running parts if input torque/ power exceed the required torque then slip occurs between the clutch plate and contact surface because it works on a specific range of torque. Single plate clutches have quick operation and respond fast. No requirement of coolant because less is generated therefore they are called dry clutches. It has bigger in size even for transmitting less torque. It requires high maintenance because they are dry clutches and it is necessary to prevent them from moisture or any leakage of lubricant/oil in machinery. Single plate clutches have high wear and tear rate and have less smooth engagement. These are used in large size automobiles where radial space is not constrain such as trucks and cars. This is all about single plate clutch working and its parts. If you have any query regarding this article, ask by commenting. If you like this article, don’t forget to share it on social networks. Subscribe our website for more informative articles. Thanks for reading it.